Yes, you did read the headline correctly! We asked if your virtual office has a smiling, professional receptionist, because some virtual offices do not have receptionists. Instead, your calls are answered by a call centre employee that is working nowhere near the physical reception area of your virtual office. He or she may be working from another city – or even another country! When choosing a virtual office, you want the person answering your calls to not only be in the same city or country as your virtual office address, but you want him or her to be answering your calls where you actually get your mail. Some virtual office packages will tell you they offer call answering for your small business, but they do not tell you where the person answering your call is located. An office business centre that offers offices for rent as well as virtual office services will most likely have the same person (sitting at the reception desk) answering your calls along with those of other office rental tenants. When contacting a virtual office provider, be sure to ask the location of the person who will be answering your business calls. Make certain that they are indeed a professional receptionist – and not just an inexperienced call centre employee who does not understand the importance of customer service. 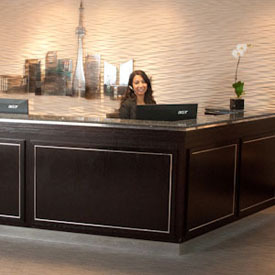 Office business centres like Telsec, that offers downtown Toronto office space for rent, also has a large number of virtual office clients who list One Yonge Street as their business address. Most of the virtual office clients will choose to have their mail forwarded on a weekly basis to their home address or their alternative business address. But some prefer to come into the office to pick up their mail and courier packages. Picking up their mail allows them to interact with the person who answers their phone calls. From time to time, a virtual office client will rent a boardroom or meeting room space at the same location as their virtual office address. This not only helps them to maintain the appearance of having office space at the business centre, but it is also much more professional than meeting at a coffee shop or another off-premise location. When the receptionist greets your visitor and then calls you on your cellphone or the phone in the meeting room, the visitor becmoes more convinced of your professionalism. Also, a truly professional receptionist at an office business centre gets to know the office clients and the virtual office clients because of daily interactions. While not always encouraged or convenient, some customers of virtual office clients will show up at the office to have a quick chat or impromptu meeting. The receptionist (who knows the client is a virtual office client) will tell the guest that they are out of the office and ask the guest to make an appointment the next time they want to visit the office. One idea that a virtual office client came up with to avoid having to book a meeting room at their office business centre, was to meet their customer at the reception area of their office and then take them to a nearby restaurant. This still keeps up the appearance of having an office at the business centre, without having to conduct the meeting on the same premises. Virtual office clients who work with an office business centre that has the same person answering their calls as well as the calls of office space tenants, get the added benefit of having a receptionist who is quick at handling almost any situation. There really is a big difference between a call centre telephone answering service and a professional receptionist at an office business centre that is front and centre every day. What About Office Space with Fast Internet?